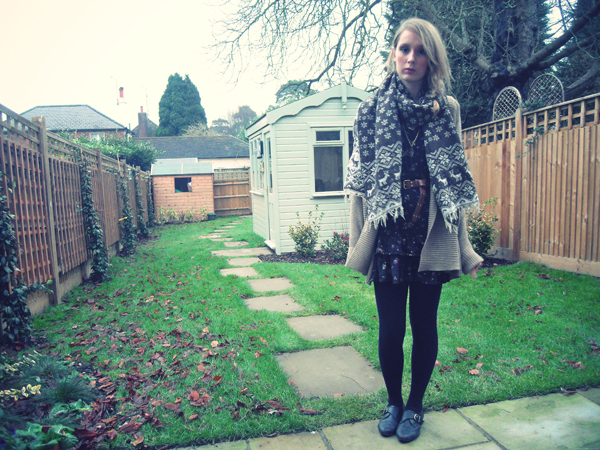 I absolutely love this scarf I got from mum for christmas. It is so Christmas-sy and cute with it's little deer prints and so very cozy. 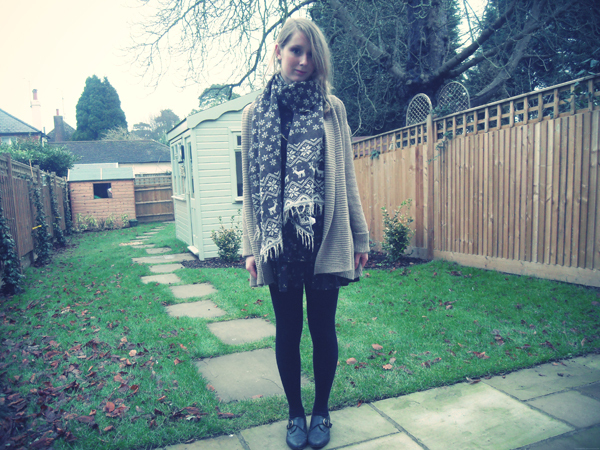 This is the cardi I got from the sale at Zara yesterday! It so warm and comfortable and will go with just about everything. Its a thick waffle knit open cardigan and kept me warm and snug all day, even during the dog walking I did this afternoon. In fact these photos were taken after the dog walk so that'll explain the state of my windswept side plait. I might add these aren't my only shoes although they have appeared in every outfit so far. They just happen to be my most comfortable brogues that go with everything. I promise I'll wear different shoes next time! The dress I originally hated when I saw it in new look in the spring but when I saw it seriously knocked down in the sale I thought I'd try in on out of curiosity. Of course as soon as I pulled it on my mind was changed and I got it, I usually hate that sort of thing but it has long sleeves (something that is a must for me for winter dressing) and is great for layering. I've noticed not enough of my outfits so far have had vintage or thrifted items in them which is odd since I'm a serious vintage hoarder. I think it may be because of the weather at the moment - extremely cold. Its also because almost all of my bags are vintage and I haven't photographed any of them yet. I will be wearing one of my vintage tops tomorrow for new years eve. I'm not doing much, just a meal at the local Indian but I love dressing up. I met one of my old school chums today for lunch and dog walking in the countryside by my house which was fun. I've never been allowed a dog which is a great shame because I've always wanted one and as a kid never stopped asking mum if we could have one. Of course now I'm old enough to get my own but I can't afford one or the space at the moment and instead I just take enjoy spending time walking my friends dogs with them. One of my friends has a Border Terrier named Louis who is just so much fun, he's a real doggy dog as in he'll play fetch and catch balls and run after frisbees like the crazy mutt he is. I've thought about applying for walking at my local dog shelter but it's a bit far away and to be honest I'm a bit terrified in-case I loose it. Maybe that'll be one of my new years resolutions? You def should volunteer- I did at the blue cross for a while, and seeing all the dogs was just gorgeous- and even though I could just walk though, I felt that I was helping them so much. so lovely. happy earlyt new year! x hivennn. cute outfit, hope you have a good new years! you have a lovely outfit !! i like your scarf ! Beautiful scarf! I really love this outfit! You have an amazing blog here girl. I'm your newest follower! I totally love this look, that scarf is an amazing piece! 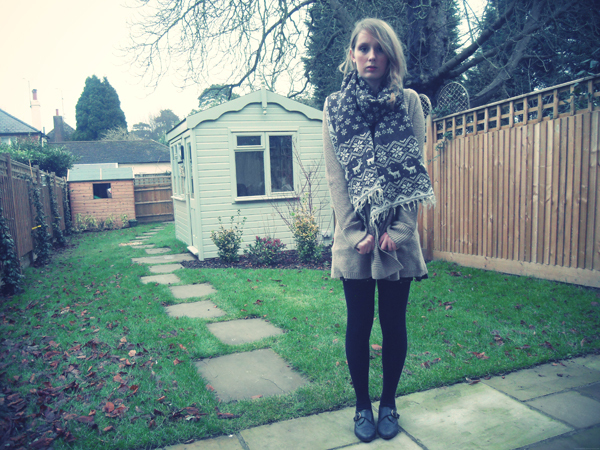 great Outfit and amazing blog. happy new year to you, too. this look is so cute and I really love your reindeer scarf! you definitely deserve more hypes! Now following and ive added you to my reel! CUTE scarf I love it !